Home→Books→When did the Army change to clutch back jump wings? This question has ended my article about jump wings for a long time. Recently I was contacted by Joe Weingarten who was able to shed some light on this. The US Army changed to clutch back in late 1944 for all wings, badges etc. However many manufacturers continued to make pin back until the start of the Vietnam era. The pin back badges were sold in Base and Post Exchanges as these are considered private sales and not government contract. The Army has never stopped issuing the WWII design which is still in use today. But by 1950 they were issuing only clutch backs. During the Vietman era they moved to the plated badges and by 1974 silver filled were no longer issued. 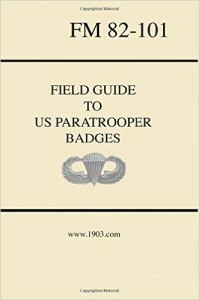 Joe is the author of the book “Field Guide to US Paratrooper Badges“, which you can buy at Amazon. Joe also has a web site selling very nice reproduction sterling jump wings. His BB&B reproduction has already been discussed on this site, but he has them with almost all the different hallmarks you can think of.